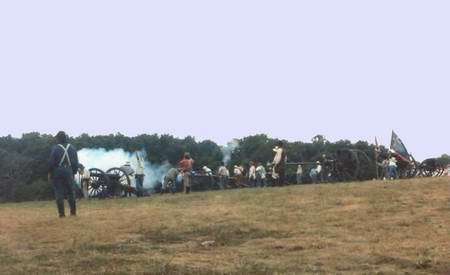 The Battle of Cole Camp was a skirmish of the American Civil War, occurring on June 19, 1861, in Benton County, Missouri. The rebel victory assured an open line of march for the fleeing governor and Missouri State Guard away from Lyon's force in Boonville. The Unionist force occupied two adjoining farms roughly 600 yards apart belonging to Henry Harms and John Heisterberg. The Home Guards referred to the location as Camp Lyon. Cook apparently had about 400 infantry muskets. While up to 900 men had initially gathered, as many as half were furloughed for lack of weapons or for other reasons. Whatever preparation Cook had taken as a result of Tyree's warning was minimal, for the pickets were overrun without alerting the sleeping Home Guard. There were admissions of extensive drinking within the camp and the men were slumbering in the early morning hours of June 19 when the attack occurred. O'Kane's infantry double-quicked from the east to the Heisterberg barn where a portion of the Home Guard were and delivered a volley into the shocked men. However, a company of Home Guard under Captain Elsinger was just north of the barn. They responded with fire into the flank of the attackers, but had little ammunition and as a result were soon forced to withdraw. O'Kane's mounted force then slammed into and drove away another nearby group of Home Guard that was attempting to form to repel the infantry. Meanwhile, the remaining unengaged Union men at the Harms barn under Captains Grother and Mueller formed to join the fracas. The presence of a Union flag now in the hands of the rebels confused the men and they held their fire until they were fired upon. They withdrew without engaging and the fighting ended. Capt. Cook supposedly fled at the beginning of the fight. He claimed to have left to consult with Captain Totten of Lyon's forces, but his men claimed otherwise. His command ended sometime in July, and his widow was denied a pension after the war. On June 19, 1861, the so-called "German Regiment, Missouri Volunteers" clashed here with elements of the Missouri State Guard fleeing south from Jefferson City, in one of the Civil War's first engagements.